Marilyn E. Weigold Peconic Bay: Four Centuries of History on Long Island’s North and South Forks. Syracuse: Syracuse University Press, 2015. Pp. 336. ISBN: 9780815610458. Cloth, $24.95. Whether you are stranger to the East End or are intimately familiar with the area, Marilyn E. Weigold’s work describing “one of the last great places in the Western Hemisphere” is a vibrant recounting of 400 years of regional history. While the South Fork of Long Island has become famous to those living both on and off the Island thanks to the glitz of the Hamptons, the North Fork has only been more recently “discovered,” in part due to its burgeoning wine industry. Describing both the North and South Forks’ history as well as the current challenges faced by the peoples of this area, this work is both informative and entertaining. Weigold is a professor of history, University Historian, and assistant chair of the Department of Economics, History, and Political Science at Pace University. She specializes in regional and environmental history and is the author of Long Island Sound: Its People, Places and Environment as well as other works including Silent Builder: Emily Warren Roebling and the Brooklyn Bridge. Writing as both a historian and storyteller, Weigold studies how the North and South Forks are a microcosm of American history. While the past has been imprinted on the landscape and its peoples, the future challenges the roles that both will play. The author ponders “whether humans can live in peace and harmony with the natural environment and . . . with our fellow human beings on a global level.” Weigold’s scholarship is balanced by the conversational tone that allows this comprehensive overview from prehistory to today to be so widely readable. As the estuary separating the North and South Forks, Peconic Bay has in recent years gained recognition for its economic and environmental significance. Located just 80 miles east of the hustle and bustle of New York City, the Peconic is the medium that Weigold uses to connect the peoples and places of the surrounding lands in this wide-ranging study of the East End of Long Island. Based on a combination of fact, folklore, and modern media sources, Weigold debunks traditional myths while probing into local events. Wandering off the beaten path of traditional history allows the author to introduce the reader to lesser known people and places that have shaped this region. While not a chronological history of the East End, themes such as “At Home,” “At Work,” and “At Play” help to organize this episodic work. Each chapter is then further divided into subsections. 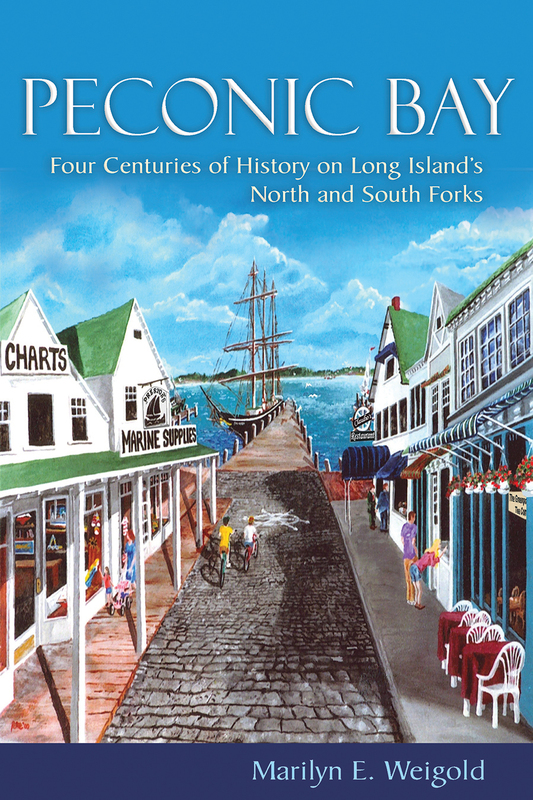 Famous historical characters such as Captain Kidd and Albert Einstein and more recent Long Island figures such as Billy Joel and Martha Stewart grace the pages of this work as Weigold investigates the North and South Forks’ colorful history. In her chapter “At Play,” Weigold explores the East End’s early art colony. Rather than simply focusing on well-known Long Island artists such as Jackson Pollock, William Merritt Chase, and William Sidney Mount, Weigold introduces us to largely forgotten artists such as Henry and Edith Prellwitz. The Prellwitzes settled in the North Fork hamlet of Peconic, where the Bay and surrounding community would inspire this couples’ artistry. Due to recent art exhibitions of their work, there has been a revival in their popularity as well as that of the North Fork’s art colony that flourished in the late nineteenth and early twentieth century. By capturing the beauty and tranquility of the East End, artists such as the Prellwitzes and others like William Steeple Davis and Thomas Moran helped to create the vacation communities of the East End. In “Down to the Sea in Subs,” a sub-section of the chapter “At War,” the reader is introduced to John Holland, the designer and builder of submarines, just as he was becoming acquainted with Clara Barton, founder of the American Red Cross. Representing juxtaposing views about military technology and war, these two figures are able to broach their differences on a day in July 1899 when Barton tours Holland’s latest submarine. While Holland’s designs would shape World War I submarines and play a significant role in the conflict, it was not the first time that underwater crafts were used in warfare or in the vicinity of Long Island. A one-manned propeller driven sub, named the Turtle, would be used unsuccessfully to blow up British ships in New York Harbor during the Revolutionary War. Through the introduction of this submersible, Weigold skillfully weaves a story about the role that the North and South Forks played in the Revolutionary War as well as later military conflicts. Weigold’s background in economics and environmental history provides some of her strongest observations. Her discussion of the wineries and the local baymen allows readers to see how the peoples of the North and South Forks have sought to the preserve local environment and its related culture while at the same time adapting to changing modern attitudes. Weigold allows both locals and outsiders to see how the communities surrounding the Peconic Bay developed and the challenges that were faced and met – whether successfully or not. Delving into the unique role that the East End of Long Island played in our nation’s history, the pages of this work bring to life the tales of Englishmen and Shinnecocks, of patriots and loyalists, farmers and fishermen as well as that of the working class, retirees, and the elite. Marilyn E. Weigold melds together fact and folklore to write a compelling history of the North and South Forks, which is not only factual but also fun.